Congratulations to Richmond FC who with this result confirmed themselves as National League 1 Champions after a campaign in which, with only three defeats, they have been well worthy of the title. 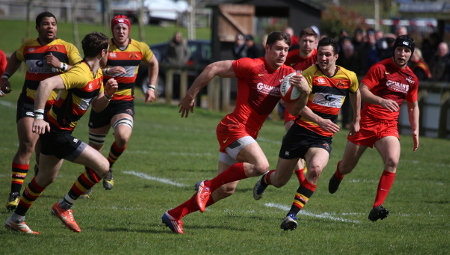 Hartpury, until now their closest challengers, will rue the fact that on the day they had enough territory and possession to have won two games, but could not find the key to unlock a stubborn and impressive Richmond defence. With two games remaining, the College have plenty of work to do to secure second place but it seems virtually certain that Hartpury RFC will continue their astonishing run that has seen them improve their final league position in every single year of their existence. Against Richmond they simply lacked that little bit of magic needed to translate dominance into scores and were susceptible to the counter-attack as, in the second half, the visitors scored on what seemed like their only visits to the home 22. After a morning of showers and snow flurries, the game was actually played in benign conditions on a pitch that looked almost as good as it had in September. Hartpury were able to field a settled side, with the introduction of the returning Joe Dancer at lock as the only change from the XV that kicked off against Rosslyn Park. However it was Richmond who were quicker into their stride and, after a third minute Rob Kirby penalty, they were the first to cross when winger Houghton squeezed into the corner with seven minutes on the clock. Hartpury’s forwards looked up to the task and they were back to within a point before too much longer. A series of forward drives took them ever-closer before Jake Polledri span out of a tackle to score. The pattern was set, with Hartpury working their way through phase after phase in Richmond territory, but with the visitors looking dangerous on the counter. Hartpury fears were realised on the quarter when a Richmond attack was kept alive through good support play and scrum half Sam Stuart took the opportunity to dart over by the flag. Kirby and Hartpury’s Gareth Thompson exchanged penalties before the game was enlivened by another try. Jonas Mikalcius has had a breakthrough season at this level and after the half-hour was able to show why Premiership clubs have been interested in him. Another Hartpury back-line move looked to be going sideways before the big winger took his chance. Receiving the ball close to half-way he had the ability and power to step around his marker and then put on the gas to outstrip the cover for a typical long-range try (pictured). Frustratingly, for all of their control, Hartpury were guilty of getting caught out at the breakdown and a further kick from Kirby had Richmond four points clear at the break. The second half began as the first had finished, with Hartpury pressing hard, but already there was a sense that the home side were not getting the return on the scoreboard for their investment in winning and retaining possession. They felt they had made the breakthrough when the forwards drove over, an incident in which Richmond’s open-side Allcock was yellow-carded, only to be brought back by referee Davies. But the disappointment was short-lived as James Stephenson bundled over from a driven line-out and Hartpury had the lead for the first time. Sadly, that advantage was fleeting. Hartpury unnecessarily conceded a penalty from a bungled kick-off return and Richmond returned the favour – flanker Jamie Thompson finishing the catch and drive to edge his team back in front. Still the students pressed and another breakthrough came just after the hour as Mikalcius collected his second. Taking a pass from Eves he seemed about to be swamped by the Richmond cover, but Davies, Kirby and Stuart were all bounced off as he made his way to the line. Back in the lead and controlling possession, it seemed likely that Hartpury might get the clinching score to extend the season. But frailty in defence was again their Achilles heel as, with 10 minutes to play, another rare Richmond foray created the opportunity for replacement Tom Sargeant to stretch out and grab the score that eventually won the match, and the league title, for Richmond. For all of the College’s efforts, the remaining minutes yielded nothing and the Richmond celebration of the final whistle was immense. Again, congratulations to them for a fine season. Hartpury now face a tough trip to Plymouth Albion before concluding the season in a home fixture with Ionians. Apart from Richmond’s title, all other significant issues were resolved yesterday also. Defeats for Wharfedale and Cinderford see them slipping down to League 2, along with Henley. Ampthill beat Fylde to keep the pressure on Hartpury for the runners-up spot, while Blackheath’s home draw with improving Coventry keeps them anchored in fourth. Hartpury: Forrester, Robinson, Eves, Boulton, Mikalcius (Tries 34, 62), G Thompson (Cons 12, 55, 63; Pen 27), Cochrane; Merrey, Tanner, W Thompson, Chan, Dancer, Stephenson (Try 54), Polledri (Try 11), Oakley. Bench: Taylor, Clarey, Voss, Evans, Perry.